Ian Stott our District Commissioner made 4 visits to Hayling and in total presented 19 Chief Scout's Silver Awards, 1 Chief Scout's Gold Award and a 5 year service award. On Monday he arrived to Saturn Pack's meeting to present the award to James Hoyle, Joshua Boniface, Jack Silver, Matthew Roberts, Daniel Law, Matthew Pickles and Joe Scott-Parker. 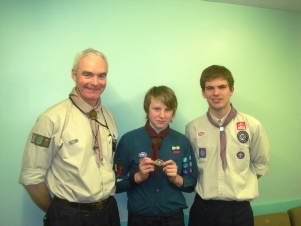 On Tuesday it was the turn of Eagle Troop to celebrate Ollie Tonkin receiving his Gold Award and Leader Ed Harrison receiving his 5 year Service certificate. and on the Thursday (a week later) Ian was back on the Island to present more Silver awards to Michael Dyer, Lewi Campbell and Dominic Allgood of Mars Pack. After each presentation Ian congratulated the Cubs and Scouts on their great achievements and paid a special tribute to the support of the Leaders and parents in helping the boys reach this pinnacle in their current section. Congratulations to Maureen Spencer, Minnie Deans and Karen Welsh who each won £25 in our latest draw. We are now renewing membership for the 100 club 2010/2011 and existing members will receive a form and details in the next few days. A copy of the form is being sent home to every parent and for our supporters you can get a form from our website or by contacting Ian Hawke. Well done to Matthew & Michael Kenny for organising a Family Quiz Night (with the help of Mum and Dad!). 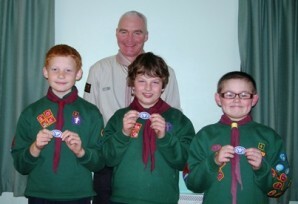 The event raised over £800 towards their Jamboree Funds. The next event being organised by the team is a Race Night with a difference. This will take place on Saturday 24th April. Why not book a place? The cost is £5 to include a light ploughman's supper. Bring your own drink and be prepared to take ownership of a horse and to place your bets on the outcome. See our website for details. If you shop in Waitrose in Havant, you may also see our Jamboree Scouts offering to help pack your bags, with the funds also going towards their £2,000 target. 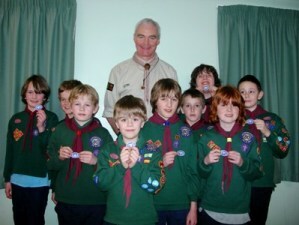 The Scouts are also looking for jobs appropriate to their age and ability to raise money towards their expeditions. If you have any jobs then please contact us and we will assess whether or not we feel they are able to help. You can either send an email to gsl@haylingscouts.org.uk or contact Ian Hawke. You may be aware that we have received a very generous bequest of £50,000 from the late Irene Day. A number of you have already asked what our plans are to make best use of this money. Irene Day supported our Scout Group over a number of years with her main interest being to ensure that the Leaders have the equipment and facilities they require. Based on this and a number of discussions amongst the Leaders, we have initiated a project that will result in the purchase or lease of a plot of land that will enable our Leaders to extend the outdoor activities we offer. This is clearly an important project and does not have a fixed timescale as we look to see what opportunities exist. If anyone would like more information, or has any ideas that may help us progress this project then please contact Ian Hawke. 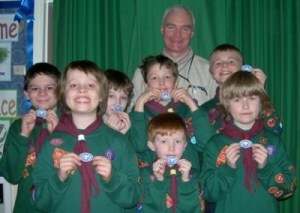 Whenever a Beaver or Cub gains their top award they not only receive a badge but are invited to a special reception, held in the Council Chambers, for themselves, their families and the Leaders. At this reception a certificate of achievement is presented by the Mayor of Havant. The photograph below shows the Mayor, Cllr Jackie Branson with the Bronze & Silver Award holders from Hayling. Advanced notice of this special review of our events plus presentations & displays on the Explorer Suisse Adventure, our Birthday Camp, Summer camps 2009, including the Eagle Troop cycling tour of the Normandy Beaches. Everyone is welcome. Friday 23rd April 18:15 to 19:15 at St Mary's Church on Hayling.